It’s always risky leaving it too long before writing a ride report, and with one of the rides of this entry being more than a month ago it’s entirely possible I’ve forgotten or overlooked some important details. Evita se Audax is a ride we’ve ridden often, and it’s “just a 200”, so is there really much left of interest worth writing about? Luckily, it turns out rather a lot – although the ride was the same, the circumstances were not. On a personal level, it was my first Audax since the crash, and the first ride where the extent of my healing would be properly tested. How much endurance fitness had been lost in the weeks off the bike? How much discomfort was I going to suffer after more than eight hours on the bike? The route was well worn, but how I’d hold up to tackling it was a complete unknown. On a local randonneuring level, there was another subtle difference too – this was the first time we’d scheduled an official Winter Series of Cape Audaxes, and this was the first ride of that series. A ride which in summer would normally see us riding a tailwind out and battling a headwind home should be the opposite – the prevailing winter northwesterly wind should be in our faces going out, and push us home over the latter half. Except there was no wind – none at the start, and none forecast for the day. 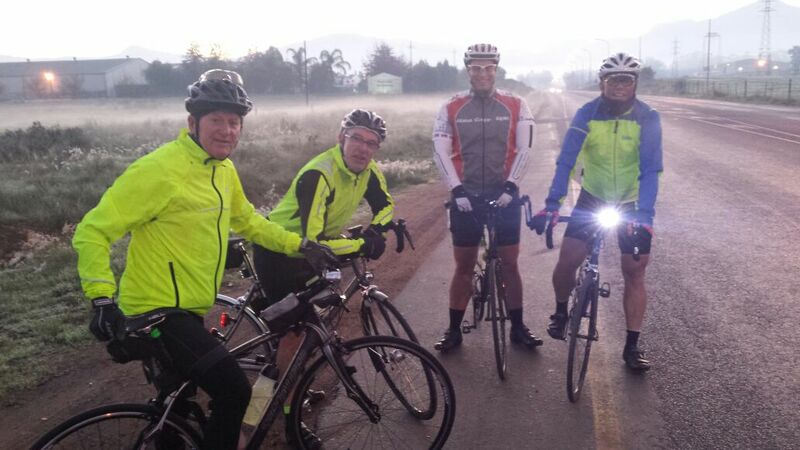 Instead, our small band of five riders started out in the thick mist and biting cold of a perfectly still winter’s morning. We made rapid progress to the first control at Hermon, aided by the presence of Wimpie who, bereft of his normal fast group, did the bulk of the work up front and set a nicely measured pace. Du Vlei padstaal was only just open as we arrived, and a very welcome sight it was – by now toes and fingers were succumbing to the cold and becoming useless lumps lacking any feeling. Even by our normally relaxed standards we lingered far longer than usual – two cups of coffee each, some sweet and sticky dadel vingers (date fingers), and various other assorted snacks. The banter was good, the atmosphere congenial, and with it the warmth was slowly returning to our extremities. By the time we left the sun was fully up, burning off the last wispy threads of mist and slowly ushering in some warmth to the day. 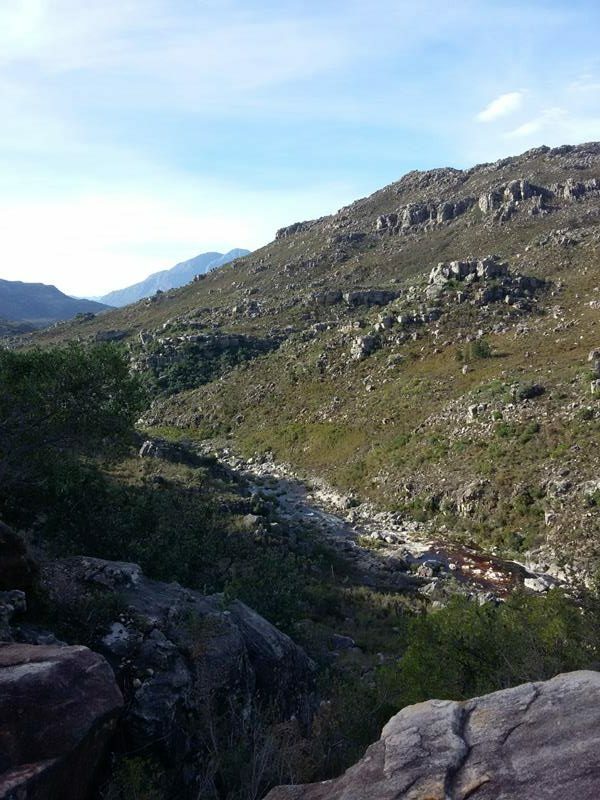 So much so that we paused briefly at the foot of Bothmaskloof to shed layers in preparation for the climb ahead. Sure enough, as we rose up the slope the air became noticeably warmer – combined with the stunning, crisp views it was shaping up to be a lovely day. As is typical, the gradient split us up, although eager to press on we didn’t hang around at the top, instead we came back together as a group on the descent – albeit briefly. The faster riders hitting the front and then stretching out slightly ahead as we swung right at the R45 junction and headed into Malmesbury. The slopes up out of Malmesbury towards Darling concertinered us again, regrouping again only as the last rise gave way to the rolling contours that would lead us to the next control. The higher than usual pace from our early morning stretch continued and on a couple of occasions myself and Gerhard slipped off the back – in truth it was probably more me, I suspect Gerhard was hanging back to keep me company. Wimpie, Nico and Theunis were quick to notice me struggling and eased off to pull me back into the group – for me, the pace was still high, but that extra couple of Km/h they dropped was all that I needed to be able to hang in there. I even managed a couple of short turns working on the front, spurred on by the sight of Darling in the distance as the last of the rollers unwound and we made our way across the rubble of the roadworks towards the control. The town was busy with other cyclists – mountain bikers taking part in the Darling Extreme ride. The atmosphere was rather festive, and somewhat amusing as marshals attempted to direct us off with other riders down a section of dirt track where the trail crossed the road at the start of the town. As we pulled to a stop at our usual cafe I couldn’t believe the Garmin – 11:30 – the earliest I had ever reached this point by a large margin. Five and a half hours for the first 123km, and that including a lengthy and leisurely early stop. It was way more than I had expected for my first long ride back and I knew there was likely to be a heavy toll waiting to be paid somewhere down the road. For now though, I savoured the moment – as we sat in the bright sunshine, tucking into toasties, chips, and glasses of Sprite with bottles of beer to mix into our own shandies. That toll was not long in coming. Fatigue combined with a full tummy, the gradually building heat of what was becoming a warm winter’s day, and those unpleasant rolling hills repeated in reverse. The result was inevitable, I wilted badly. I sat on Wimpie’s wheel, just to the left to get the maximum benefit of the shadow from the slight breeze, and clung on. At some stage he passed me a Gu gel – it was a friendly gesture, and I slurped it down willingly, but the immediate boost such fuel often brings was not there. The energy hole I was languishing in had been dug too deeply and too fast – it was going to take time, and a much slower pace to fill in. For now, I just had to hang on and survive to the control. Fortunately, at around 40km, this was one of the shorter legs on our rides and the relief was not long coming. 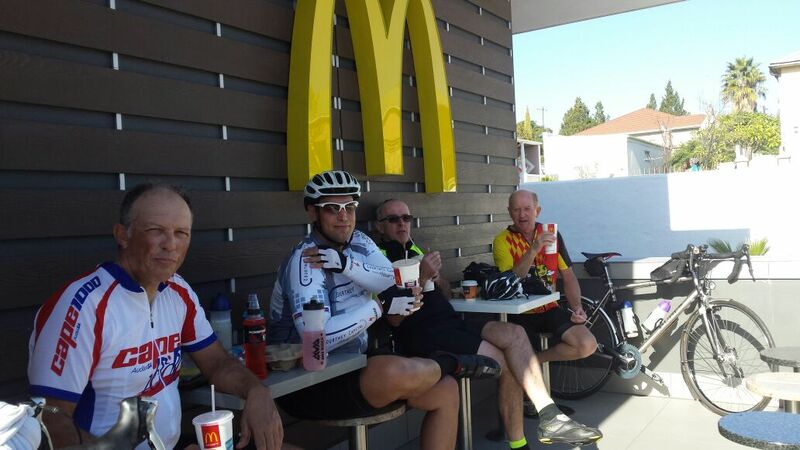 The five of us sat outside McDonalds slurping milkshakes and, in my case, also downing a much needed coffee. The fast service made a pleasant change to the Wimpy, which on our previous visit had been a painfully slow affair. Over the last stretch we had left winter behind completely, and ridden into a hot and summery day, barely a cloud in sight and just the faintest of breezes. Wimpie was keen to push on, and Nico and Theunis had the legs and spirit to follow. I glanced across at Gerhard and was glad to see his lack of enthusiasm to rush away from our temporary sun deck. We were both knackered – and it was way too nice (and hot) a day to flog ourselves to death. With literally hours in hand, we opted to spin out the last 50km or so at a recovery pace, and enjoy the sublime riding conditions. So we sat some more, and enjoyed our drinks, as the other guys rolled out of the car park and sped off to hammer out the last stretch. Eventually, having rested enough, we also gathered our kit together and rolled out – albeit without any hint of speed. The road from Malmesbury back to Vrede is probably one of our most ridden sections on any Cape Audax, but I can’t recall ever having ridden it with Gerhard before – certainly not just the two of us. Although we were both extremely fatigued, and at times our pace was laboured, it was thoroughly enjoyable. The breeze had picked up a shade, but not really enough to become a troublesome headwind. The rollers did wring the last drops of energy out of our legs though, and it was a huge relief to see the final downhill run to the bridge over the N1, and the wonderful sight of the road home beyond. Despite our leisurely final stretch, our time was still a fairly respectable 10:40, with around 8:30 riding time. I’ve not checked all of my records, but am pretty certain those are my best times for a 200km Audax yet. Ordinarily, at this point I’d make a comment about time not mattering on an Audax but in this case it did for me – a part of this ride was a test of my recovery from the crash and, fitness and pace wise, it had been a successful test. But it also showed how much more was left to do – that time and pace was the absolute limit of what I had inside on the day, and I was stiff and sore at the end. I wouldn’t have been able to spend any longer on the bike, and certainly would not have been able to bash out another 200km at even half that pace. There was a lot of work still to do. One of the topics of conversation over a well earned beer back at Vrede was the idea to use the Winter 200s to experiment with some new routes to mix things up and keep the riding interesting. The first of these routes was mapped out to experiment with for the next ride in June. We’ve used Du Toits Kloof once before on a Cape Audax, the 600km in March last year when bush fires ruled out our usual route over Bains Kloof. I didn’t ride that brevet though and, despite the guys saying it was fine, I was a little nervous of how heavy the traffic would be on the short stretch after the pass leading to the right turn to Rawsonville. As it happened, I should have been more concerned with the weather. It was bitingly cold when we started out from Vrede, I forget the exact temperature but somewhere around four or five degrees comes to mind. It wasn’t just the cold that was cause for concern either. As the road swung left and traversed the mountain side above the mouth of the Hugenot tunnel, sudden blasts of wind struck us out of nowhere. One moment we were chatting and remarking on the kind weather as we climbed slowly up the pass, and the next second we were nearly blown off the edge of road. At one point I had to uncleat and pull over to the side of the road to wait out the strongest of gusts. The wind did die down a shade, but continued to swirl around us as we slogged up the remainder of the pass. Theunis crested the pass first out of our group (Chris, Marius and Wimpie already far ahead) and Grant and I watched him pull over to the side of the road to wait for us following just behind. The gap through the hills funneled the chill wind with ferocious force though – it was no time to be standing around enjoying the view, so we pushed straight on down the other side. It was far from a pleasant, free-wheeling descent though. Where the road took us into the teeth of the wind, we had to pedal to even make progress downhill. This was almost preferable to the corners though, which swung us away from the wind and needed a steady hand and firm resolve to lean the bike into the maelstrom and try and hold anything approaching a line. Who switched the lights out? Theunis was just up ahead and already in the tunnel as I suddenly went from day back into night. The transition was near instant, and the blackness almost total – I could not see a thing apart from (literally) the light at the end of the short tunnel, and Theunis’ rear lamp blinking away at me. I was too scared to take my hands off the bars to fiddle with my light in case I hit some obstacle, so I rode on trusting to blind luck that nothing was in my path. I was almost half way through the tunnel before my sunglasses tint faded, and a dim glow appeared on the road ahead confirming that my light was still working. One of my scariest moments on a road bike had passed, and Theunis, myself and Grant rode back into the light and down the final stretch to the junction with the N1. As I had feared, the N1 was unpleasant – but not because of traffic. With a wide safety lane, what few cars and trucks there were passed well clear of us such that even the fast moving ones were never a bother. The wind was another matter – directly into our faces, what should have been a short, fast and mostly downhill section to Rawsonville was a slow slog into the storm. After what seemed like forever, the right turn arrived and we could finally make our way along the old R101 towards the control. The three of us had earlier discussed a quick control at the Total garage, but were now sufficiently fatigued that a proper breakfast seemed a much better idea. When Nico joined us and concurred, the decision was made – at the risk of another slow service and lengthy stop, we headed to the bush pub at the start of Slanghoek valley by the turn to Goudini Spa. 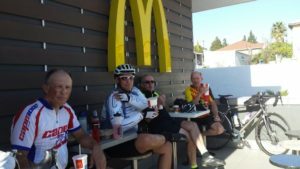 The chances of a quick stop grew slimmer with the sight of a large group of bikers already parked there, but our luck was in – they had finished their stop and were readying to leave. The waitress hadn’t even finished putting menus and table mats down. We’d agreed we would order as soon as arriving, and Nico had spied exactly what he wanted on the chalk board as we rode in. It sounded good – so I ordered the same. The coffees started to arrive surprisingly quickly, before Marcus and Andre had caught up – so we cancelled theirs, figuring they had opted for the garage stop. At some point we swapped tables to one in a sunnier spot, the morning chill still rather unpleasant now we’d begun to cool down. Food soon followed, and we were almost done and onto our second round of coffees before we saw the other two guys riding past and into Slanghoek. The bush pub has always been a lovely spot for a break and the food consistently good – but for the first time we rolled out complimenting the quick service rather than complaining that we’d stopped for too long. The wind was now fully at our backs and we flew through the picturesque valley at record pace – my Garmin reading well above 30 for most of the way. It wasn’t long before Nico’s power started to outstrip me though and I dropped back to a more manageable tempo. Theunis stuck to his wheel and for a short while so did Grant, but eventually he fell back and the two of us rode on together. Somewhere along this section for the first (and only) time of the day I began to warm up and feel a little over dressed. I shed long fingered gloves and beanie into my top tube bag, with some concern that I might soon need to strip off more layers than I had room to stow. 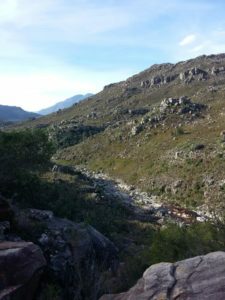 The problem never materialized though – except for that one short, warm climb out of Slanghoek, the wind that rocketed us onwards also kept me from overheating. We caught up with Andre and Marcus again on the outskirts of Wolseley, and the four of us sailed out on the wind to the second control, at Tulbagh. More than once we commented on the tilting trees, bent over with the force of the wind we were riding – coming back was not going to be anywhere near so fast, or pleasant. This was my first visit to Tulbagh. It looked a quaint little town – at least what I could see of the Cape Dutch architecture across from the Shell garage forecourt. Still full from breakfast, and not wanting to linger before tackling the storm, a brief stop for chocolate milk-shakes and snacks was all that was needed. We were soon rolling back out, joined by Theunis and Nico who’d stopped at a shop somewhere further down the main road. The rolling lane across pastures which had seemed so scenic on the way in was now a brutal fight – us against the gale. And one by one, it ground us down and split us up. Before long, the group which started out as six was stretched out along the length of the short road back to Wolseley. It was meant to be a few kilometers and a quick stop on the way back to Wellington, purely there to ensure no short cut could be taken via Hermon – but it took an age. I’m not sure I’d have made it at all if Theunis hadn’t taken the front and given some shelter from the wind. I did take my turns on the front, mostly head down and slogging, but my recollection is that Theunis did the bulk of the work. That quick stop in Wolseley lengthened into more of proper rest – as all six of us gathered together again for a much needed break. Somewhere around here, or soon after we started out again, Nico realised he’d mistaken the kick off time for the rugby and that, being 5pm not 6pm, we were unlikely to be home to see the game. Several of us commented about calling for a ride home and, as the rest of the afternoon wore on, I started to think more and more seriously about abandoning. Our pace did pick up a bit on leaving the control, the wind a little lighter and less directly into our faces. We held as a group until the start of Bainskloof pass, but then began to separate on the first winding section of road leading into the pass proper. Unusually for me, I found myself at the back. Bainskloof is normally a pass I relish and charge at full tilt, but today the engine would not respond and I watched the bulk of the group slide away ahead as the distance between us gradually grew. Only Andre hung back with me, also now struggling to keep the legs turning. Also unusually, neither of us reeled in any of the riders ahead as the pass grew steeper and rose up and through the mountains. If anything our paced dropped and, another first for me, we even stopped to rest on the climb – twice. I was absolutely broken by the top, exhausted and sore. I was almost certain I was going to be looking for a taxi home in Wellington. But, even though the corrugated road was hand-numbingly jarring, my legs and lungs recovered in the time it took to descend. Instead of reaching for my phone when we pulled into our regular stop at the Shell garage, I went inside and ordered a large coffee with two sugars, and a big slice of pizza. We sat as a group of six again on the kerb outside the shop on the forecourt. All of us were knackered, fed up with the wind, and wanted to be home. We jumped at Theunis’ alternate route suggestion of going via Paarl. It proved an excellent suggestion – close on exactly the same distance to the Arrivee and almost dead flat. 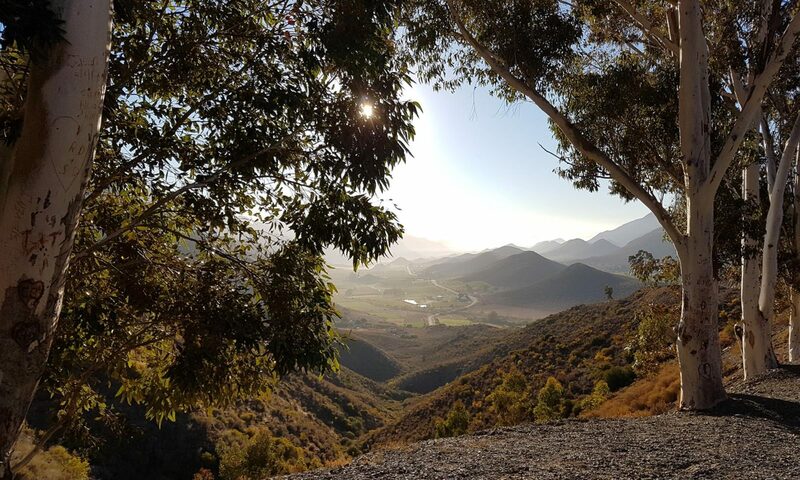 Marcus’ comment in Tulbagh that the wind would die down by late afternoon also proved correct – despite the fatigue, our wheels ate up the final kilometers to the last garage stop of the day – the BP in Klapmuts. A few minutes delay whilst Andre fixed the puncture that had been gradually leaking air all day meant it was nearly dark by the time we got there. The only Cape 200km we had started and finished needing lights on. There was one small, final chapter to this ride – a short 10km “neutral zone” back to Vrede, needed to ensure the main ride stayed within the BRM 5% over-distance allowance. It wasn’t the unwanted chore I’d been expecting and passed surprisingly quickly and easily despite tired legs. Spirits were high, banter was good, and we positively raced down the last stretch and up the Vrede drive (although Marcus did lose his chain and nearly hit the dirt on the short temporary gravel stretch around the entry gate renovations). Nico made a bee-line for the end of the rugby – although from his text later, it seemed he regretted it. The rest of us hung around in the car park and swigged a Flying Fish beer each which Andre had thoughtfully packed into a cool bag in his car. It might have “only been a 200” but it had proven a tough one. The time may have been more than an hour slower than the previous month, but simply finishing it felt like a victory worth celebrating. This new 200km route is certainly a good one for anyone feeling like a real challenge. I’m not sure the Ceres variant of it that we will ride in August will prove any easier. Bizarrely, I’m looking forward to finding out. User error on the Garmin front – no log for this one. Must remember to hit save as a precaution and not rely on auto-save when starting back up. Sometimes that doesn’t seem to work if you connect direct to computer the next day without powering up first, causing the current track log to get lost. Overall time was 11:50, with a riding time of about 10:30. Lekker memories. Pity about the rugga. Thanks for the write-up. I absolutely loved the scenery of the last 200km. Looking forward to the August one. Agreed. Never ridden Mitchell’s Pass either – looking forward to that part especially. Haha Theunis we all know you – change that ‘most probably’ to a definitely. Great write-up as usual Rob. Looking forward to the next ride.